Slater Reports: Happy Life Day! It's that time of the year again . . . to reflect on the fact that some pieces of entertainment are so bad that they actually transcend the familiar "So-Bad-It's-Good" phenomenon and fly right past bad on their way to being unwatchably horrible. 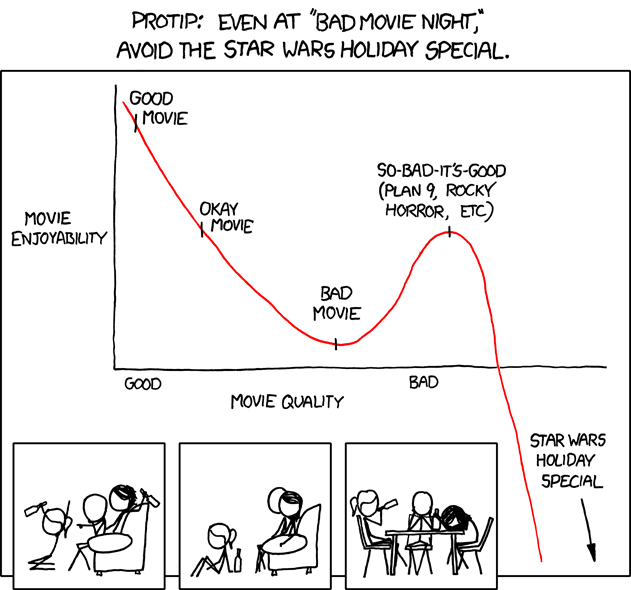 The paradigm case of this is "the Star Wars Holiday Special" [fascinating wikipedia entry here]. I have first hand experience that exactly corresponds to this cartoon: a few years ago, we had a bunch of friends from out of town over for an early December holiday party. I had heard rumors of the existence of the Holiday Special years earlier, but thanks to the internets, I confirmed that it wasn't some kind of urban legend, obtained a copy (it was much still somewhat hard to find at this point), and broke it out as a Christmas Surprise. There was a near mutiny; we all felt awful. Now, you're probably asking yourself: how bad can it really be? Well, take a look. I recommend small doses initially; unless you've done something really bad in your life. In that case, you should watch the whole thing in one sitting . . . in the morning.